The two Vanilla Orchids featured on this website, Gymnadenia rhellicani and Gymnadenia rubra, are members of a group of closely related orchids sometimes categorised together as the Gymnadenia nigra group. 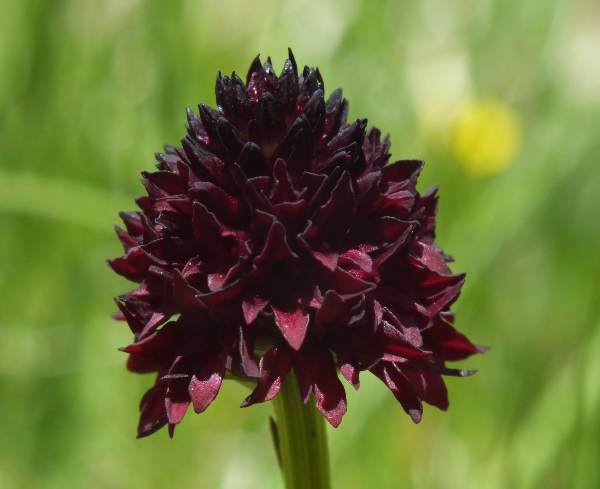 Molecular study shows that they are closely related to the Fragrant Orchids, such as Gymnadenia conopsea which occur throughout a vast range of countries in Europe including the UK. While some similar-looking orchids can be differentiated because they are cross-pollinated by different species of insects, the Vanilla Orchids present a particular problem because they grow in such extreme and inhospitable habitats that insects are not always present. Ongoing molecular study may solve some of the problems of accurate identification of these orchids and the true extent of their territories. The plant grows from 5-30cm in height and has between 7 and 11 leaves at the base of the stem and several further narrow bract-like leaves growing higher up and sheathing the stem to just below the flowers.The upper leaves and stem are marked with red. The infloresence of Gymnadenia rhellicani is conical at first, becoming egg-shaped when all the flowers are open. Although normally a very dark purple, the flowers can also be red, orange, yellow or white. They are highly scented with a sweet or spicy vanilla odour. Its territory in Europe extends from the Alps to the Carpathian mountains. Among other countries Gymnadenia rhellicani grows in Bulgaria, Greece, Italy, Romania,Slovenia and Spain. 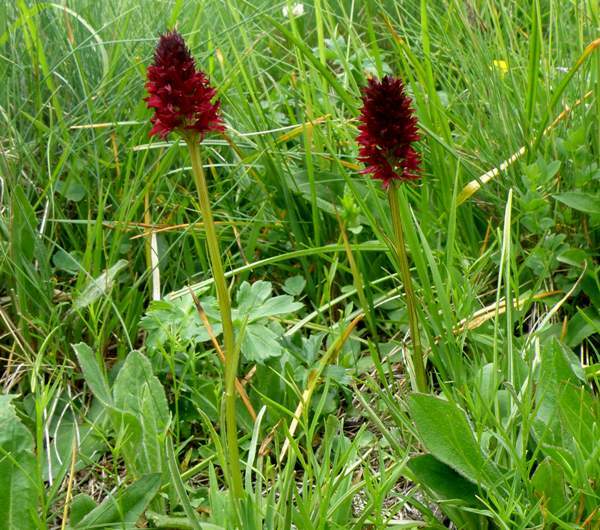 This orchid can be found in short grassland and alpine meadows between 1,000 and 3,000 metres above sea level. It grows in dry to slightly moist conditions in open sunny positions on calcareous substrates. Although localised Gymnadenia rhellicani can often flower in large numbers in favoured locations. Gymnadenia rhellicani flowers from the end of June to the middle of August, which is much later than many other orchids that occur in the same regions.